It’s that time of year again, where the air is so hot and stifling that you crave the relief of walking into a cool, air-conditioned building or home. Your unit works well and keeps your house cool on the hottest days, so no worries right? WRONG. Your air conditioning unit could be becoming a health hazard to you and your family. You wouldn’t drive your car for 50,000 miles without changing the oil. The same should apply to servicing your HVAC unit. The months of June, July, and August are going to be sweltering. According to weather.com, "There is a historically large amount of background global warmth around that will likely skew all temperatures towards the warmer side for the next few months.” As mentioned in our previous blog, the La Niña will be bringing extreme temperatures. Therefore, your HVAC system will be cranked all summer. The longevity and efficiency of your HVAC unit is determined by how often it is maintained. However, there are more dire effects that lack of maintenance could have: negative health effects on YOU and your family. HVAC units work simply: they produce cool air and circulate it throughout your home. The hazards occur when the air being circulated throughout your home becomes contaminated, or the equipment in your unit becomes bacteria ridden. How does this happen? Lack of maintenance! Imagine a vacuum cleaner being used for months on end without emptying the canister. It becomes congested with dust and dirt, and works much less efficiently. Sometimes, the vacuum will even spit some of the dust and dirt back out onto your floors. The filters in your HVAC unit get clogged with dust and dirt similarly. These clogged filters result in polluted air being generated throughout your home. The filters should be changed every 30-90 days, depending on the style of the filter and the number of pets in your home. You can change these filters yourself, or contact a certified Shipley technician for assistance. 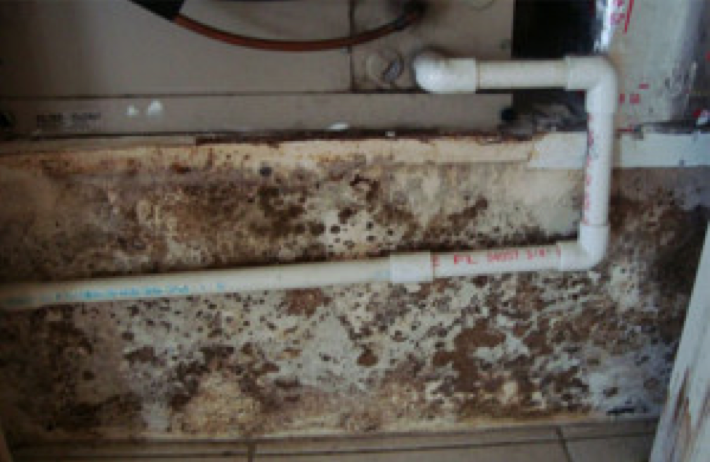 Worse, the condensation produced by HVAC units in the drain pan could cause mold and fungus to grow. As this fungus grows within your unit, its particles are being distributed in your home and yourself, your family, and your animals are being exposed. The mold could be making people in your household sick as it proliferates in the pan. Even if you don’t see the mold, if there is an odor it could still be there. The graphic below shows a severe case of mold growth in a unit. Pollutants from your HVAC unit being generated throughout your home could create new illnesses or aggravate existing problems such as allergies, asthma, and sinusitis. Don’t let yourself and the people in your home become susceptible to worsening existing health problems. A more serious effect of dirty HVAC filters is Legionnaire’s disease. The disease is not spread from person to person, but instead through the mist produced by HVAC units. It is a severe form of pneumonia. An infection in your lungs causes them become inflamed, hinder breathing, and cause a harsh cough. Why put your family at risk to something that is so easily prevented? Keep the air in your house clean and safe to breathe. Be aware of the importance of regular maintenance on your HVAC system, and schedule it! This includes filter changes, duct cleanings, and overall service by a technician. Don’t be a victim to your own home. Schedule your duct cleaning with Shipley Energy today!